9 Best AR 15 Muzzle Brake Reviews  - Supreme Recoil Reduction! The recoil of the 5.56mm round is totally manageable. However, tactical shooting is one of the best uses for an AR-15. That means a lot of rapid fire from unstable shooting positions. So, even though the recoil is bearable, more recoil mitigation means faster and more accurate multi-shot strings. So, a muzzle brake is most useful in the most common AR-15 shooting contexts. Not only that, but there’s no reason not to reduce recoil for slow-fire shooting. It just makes it more comfortable. Fortunately, the median price for a muzzle brake is about $100. And a muzzle brake can reduce recoil by over 70%. A muzzle brake gives you more performance-per-dollar than almost any other modification. There are a lot of muzzle brakes on the market. We’ve got some rapid-fire reviews of the best muzzle brakes to help you pick one that’s right for you. First, quick spoiler: If you’re eager to mash the buy button, buy the Precision Armament M4-72 Severe-Duty Compensator. The price is good, and the performance is better than any other brake we cover here. The Precision Armament M4-72 Severe-Duty Compensator tops the performance charts with 74.03% recoil reduction. In terms of sheer performance, this is the best muzzle brake for hunting and competition. This is mostly due to the rearward baffles that redirect gas to the sides and rear, away from the shooter. The baffles also have a slight upward angle to help mitigate muzzle rise, as well. The bottom of the compensator is closed, which minimizes your dust signature when firing from kneeling and prone positions and keeps your view of your target clear. For easier handling, the M4-72 is compact and follows the contour of the barrel. It’s about the size of a standard birdcage flash hider. So it won’t snag on gear or clothing during high tempo or high stress shooting. The only thing to watch out for is the concussion. This unit delivers a bit of pop to anyone standing to the side of your rifle while you’re shooting. In the end, this model definitely delivers the most bang for your buck and offers excellent recoil mitigation for any shooting context. The price also makes it the best muzzle brake under $100 (though just barely under $100). The V Seven Weapon Systems Furion Muzzle Brake reduces recoil by 64.36%. The recoil reduction is better than most. However, titanium construction makes this model lighter than average. It comes in at just 1.67 ounces. So it’s a good candidate for lightweight rifles. The Furion is tuned for 14.5 to 20 inch barrels, and the baffles are more open on top of the device to reduce muzzle rise. This muzzle brake delivers it’s best performance on tactical carbines. A closed bottom reduces dust when shooting from the kneeling or prone, for better target visibility. Lastly, the Furion comes in either silver or black. So you’ve got aesthetic options. Sadly, the price point is a tad high. So the performance-per-dollar is a bit lower than other muzzle brakes. The Furion is best for competition shooters who need a lightweight rifle to reduce fatigue and can use their shooting grip to deal with recoil. 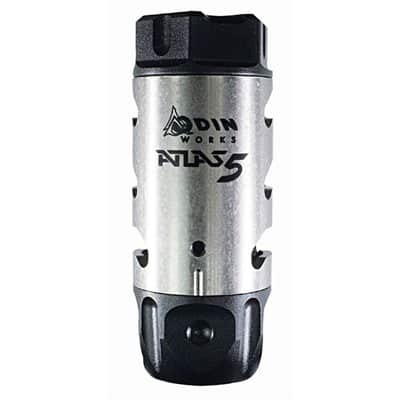 The ODIN Works Atlas 5 Compensator reduces recoil by 64.09%. What makes the Atlas 5 unique is the three-piece construction. This design makes this unit super easy to install. The piece that fixes to the the barrel doesn’t need to be timed, just tighten it down. There’s a titanium sleeve that slides on and rotates easily to get the timing you want. Then the end cap clamps the whole thing together once it’s timed how you like. What’s cool is that you can set the timing to direct gases in any direction. If you’re a right handed shooter, you can time this muzzle brake to push the rifle down and to the right to combat your natural muzzle rise. Aesthetically, this is the only muzzle brake that offers a cool, two-tone look. However, when the Atlas is timed straight up, it offers only a little muzzle rise mitigation. It’s also surprisingly heavy for its size at 4.198 ounces. This model comes at a good price for an adjustable muzzle brake. It’s a great option for shooters who want customized muzzle brake performance at a fair price. The name might be excessive, but the Apex Tactical Enhanced Stabilization Attachment reduces recoil by 60.5%. The brake itself is well made and includes a vertical gas vent that helps reduce muzzle rise. However, this unit is primarily a muzzle brake. So the compensation is minimal. Additionally, the brake is very streamlined. It’s not much larger than the barrel diameter. So it won’t snag on anything. However, where this piece really shines is in the price point. It performs better than average. But the price is around half of what most muzzle brakes cost. So the performance-per-dollar is way up there. So while it’s not the best muzzle brake, it’s a great option for shooters who want recoil mitigation at the lowest possible price. The Dead Air Armament Keymount Muzzle Brake performs surprisingly well for a dual-purpose muzzle device. It reduces recoil by 56.63%. While the recoil reduction is middle of the road, the Keymount Muzzle Brake also has lugs for attaching the Dead Air Sandman-L and Sandman-S suppressors. The are three vertical vents to reduce muzzle rise. And the bottom is closed to reduce dust signature in low shooting positions. Then, the concussion is more bearable than comparable muzzle brakes, which makes sense since this model is designed to work with a suppressor. The only real struggle with this unit is the weight. The suppressor lugs add a fair bit of metal to the brake. It weighs in at 4.092 ounces. Given the weight and performance, this is definitely a muzzle brake for those who want some recoil mitigation and suppressor compatibility. The Knights Armament MAMS Muzzle Brake reduces recoil by 52.76%. That’s decent considering the MAMS serves three purposes: muzzle brake, flash hider, and suppressor mount. First, the functionality. The MAMS has lugs for attaching the KAC QDC suppressor, which is handy if you have a carbine that you use for defense and competition. The MAMS also works as a flash hider. Unfortunately, it’s performance as a flash hider is unimpressive. But, it has decent compensation capabilities. A set of holes along the top of the muzzle brake help keep the muzzle level during rapid fire. The bottom of this model is closed to reduce the dust signature when shooting from the kneeling or prone. Although this piece offers good functionality and decent recoil reduction, the price is really high. The performance-per-dollar is pretty poor. Given the price, this muzzle brake is best for people who use one gun for defense and competition, and really like the KAC QDC suppressor. The Precision Armament AFAB Hybrid Muzzle Brake boasts the performance of a fully functional muzzle brake and a dedicated compensator. The AFAB reduces recoil by 50.55%. 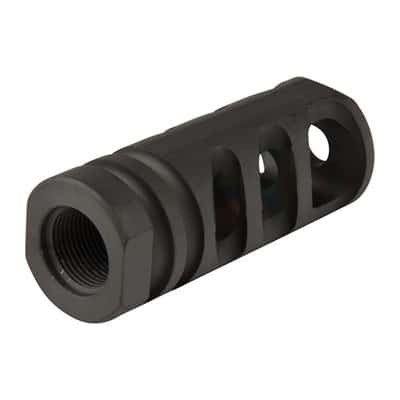 In addition to the standard muzzle brake performance, the AFAB functions as well as a dedicated compensator with several vertical vents that reduce muzzle rise during rapid fire. The AFAB also has a grid of channels that diffuse and cool redirected gases. These channels significantly reduce concussion. So this is a good option if you shoot at an indoor range. The AFAB also sports the performance of a dedicated flash hider, and reduces muzzle flash significantly more than a standard muzzle brake. This is definitely the best option for anyone who wants a dedicated compensator, but wouldn’t mind a bit of recoil reduction as well. The Dead Air Armament Sandman Ti reduces recoil by 49.45%. The performance is decent considering this is primarily a sound suppressor. The nice thing about the Sandman Ti is that it’s compatible with both 5.56mm, 300 blackout, and .308 rifles. So this is a handy piece to have if you’ve got an AR-15 and an AR-10. Since it’s a suppressor, there’s less concussion than firing a rifle with a bare muzzle. This is definitely the best option for a defensive carbine or those who want to be nice to their neighbors at the range. This is also the heaviest muzzle device in this article, by far. It comes it at 16.8 ounces. And it’s the most expensive. Even though it’s cool that this suppressor gives some recoil reduction, it’s not a great option for anyone looking for serious recoil reduction. This is best installed on a home defense rifle for the sound reduction. The Surefire WARCOMP Flash Hider reduces recoil by 35.91%. The recoil reduction is pretty decent, considering this is a dedicated flash hider that happens to offer recoil reduction. As a flash hider, the WARCOMP is one of the best. It nearly eliminates muzzle flash. This is handy for short-barreled rifles, since the muzzle flash from a short barrel can be almost blinding. It’s not a dedicated muzzle brake, so the concussion is comparable to a bare muzzle blast, which is minimal. This unit also provides mounting lugs for SureFire SOCOM Fast-Attach suppressors. The gases aren’t redirected upward. So this muzzle device generates a significant dust signature when shooting from the kneeling or prone. Lastly, this flash hider is surprisingly heavy, despite the minimal design. It weighs in at 3.845 ounces, which is heavier than most dedicated muzzle brakes. This is a good option for a short-barreled rifle or an AR-15 pistol. Shooters who want decent performance with and without a suppressor should also consider this flash hider. A muzzle brake is almost a must-have piece of gear these days, especially for competitors. Muzzle brakes give a noticeable performance boost. You’ll be at a disadvantage if you compete without one. Additionally, muzzle brakes are an incredibly cost-effective and easy-to-install upgrade. It’s bolt-on performance. If you’re looking for the absolute best performance-per-dollar, go with the Precision Armament M4-72 Severe-Duty Compensator. It’s the top performer and is priced right at the median for muzzle brakes. Now that you know which muzzle brakes are going to give you the most juice, grab a muzzle brake, torque it down, and find out how much faster you can shoot.